Fog's Clearing & I See ... 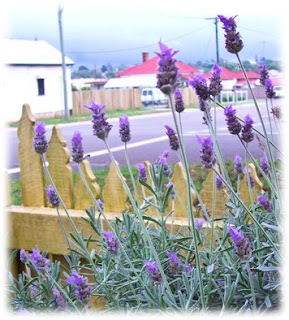 Lavender! I had a day of playing ladies on Friday - and it was LOTS of fun! Most of you will have read about my best friend-since-grade-four, Lynette. Well, it was her birthday on Wednesday and although we couldn't get together on the day, we both had Friday free, so it was quickly 'pencilled in' as a play date! 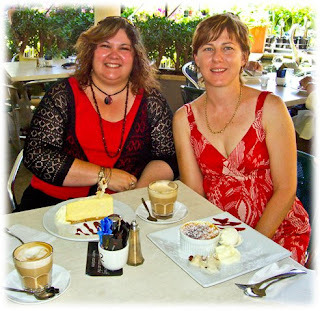 We try to get together every six to eight weeks (Lynette lives just over an hour away from me in a western suburb of Brisbane!) but due to work and other commitments for us both, it had been a bit longer, so we were overdue for a day of fun and frivolity - LOOK OUT BRISBANE HERE WE COME! Tee! Hee! Hee! Now, when we get together, we have a variety of mischief - oops! I mean ACTIVITIES - that we get up to. We might explore a boutique-ee little area (like Paddington), hit a coffee shop or two, or even hole up at Lynette's place and work on a craft project that's been 'on the list' for a while. This time, it was Lynette's choice of mischief and she decided we'd play ladies for the day - go to a nice restaurant she'd been meaning to visit for lunch, then hit a favourite coffee shop for desert and coffee. Sounds like a plan!! And so we were off!! If real life came with a sound track like the movies, I suspect Cyndi Lauper would have been singing "Girls Just Wanna Have Fun" in the background! Tee! Hee! Hee! OK - the first stop actually ended up being my choice, as we had to drive right by a shop I've been wanting to visit - Patches at Indooroopilly. While a little tricky to find and get to, we decided it was worth the stop, as there was lots of yummy fabric to admire. While Lynette was very disciplined and decided to finish the couple of projects she has half done before starting a new one, I wasn't so disciplined - some fabric followed me home! Tee! Hee! Hee! Oooohhh!! Lots of pretties!! And before any of you smarty-pants's point out the VERY pink piece of fabric, let me just say it's to make up a new pattern in an alternative colourway, NOT because I've crossed to the dark (pink!) side!! 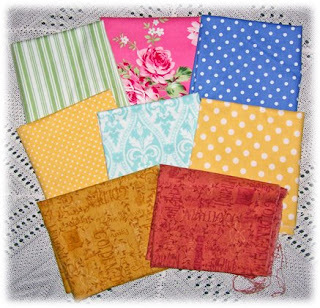 You'll notice I also managed to find myself some more dotty fabric - love my dots and spots!! 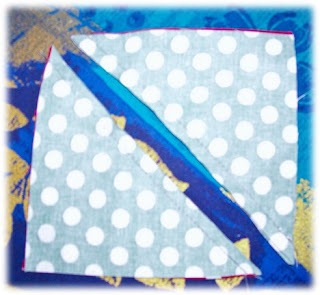 The cornflower blue spotty fabric is actually the colour I want to eventually paint my sewing room, so this piece will probably get put away for cushions or something for when that happens .... But I digress!! Back to our Playing Ladies Day! Having satisfied my fabric cravings (it had been a whole three days since I'd last bought fabric!!) we went on to the restaurant where Lynette wanted to have lunch - Lilyfields. Sorry - forgot to get a photo. Lunch was rather yummy and Lynette's curiosity was satisfied along with her tummy, so it was then off to our next stop - Gardenway, our favourite coffee shop/gift shop/nursery. After browsing through the gift shop (they have soooooooo many yummy things!!) we decided we'd settled lunch enough to enjoy coffee and desert. So ... after a day of playing ladies, I hopped in my little Baby car and toddled back up the range, having successfully and thoroughly enjoyed celebrating Lynette's birthday and our 29 years of friendship - it was this time of year when we first met in year four! Think we'll have to organise a major celebration for Lynette's birthday and our 30th year of friendship celebrations next year - any suggestions? We've got a whole year to plan, so it should be a DOOZY by the time we get around to it! Tee! Hee! Hee! 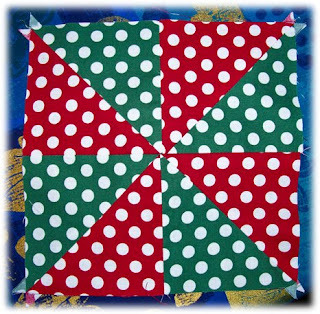 And speaking of playing ladies ... that's the name of a new beary nice quilt designed by Liz at Teddlywinks. 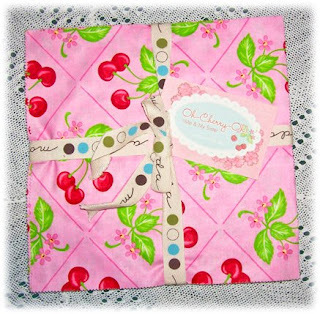 Pop on over and take a peek - it's a beauty!! Have to say, though, her bears look a bit more lady-like than Lynette and I usually manage! Tee! Hee! Hee! And now, I'm off to play some more in my sewing room - would like to say I'm going to lay with my new fabrics, but I really need to keep working on my Secret Santa gifty for Chookyblue's swap. I'm about half done and since it needs to go in the mail this week, I'd better get crackin'! Hope you're all having a great weekend - very blustery and blowy here today, so I'm happy to be hiding inside in my sewing room! Til next time - Bear Hugs! Here I am, back again! No, I haven't been blown away by the recent Queensland storms as some people have asked - just somehow lost track of what day it was and how quickly time is scooting past! I popped into Carin's blog yesterday and was horrified to find the "Countdown to Christmas" is in the 30's - EEK! Not at all ready for that - too much to do, too many things to make, too many deadlines to meet!! I should be ready for Christmas by ... say ... March?!? 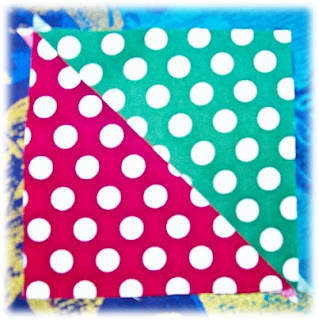 Spotty squares!! You know I'm just dotty about spotties!! Tee! Hee! Hee! Hmmm ... what will happen to them next? Ta Da!! 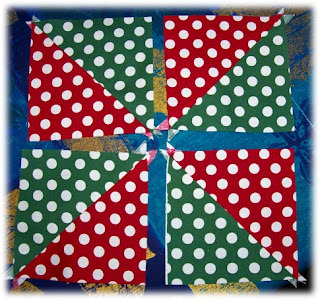 Pinwheel blocks!! 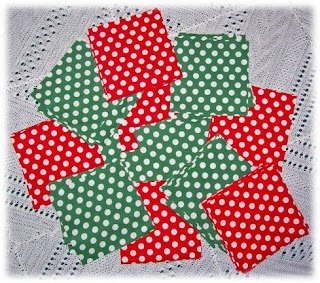 Ahhhhhhh ... but you'll NEVER guess what I'm going to turn the pinwheel blocks into, so I'm going to keep you in suspenders! Tee! Hee! Hee! 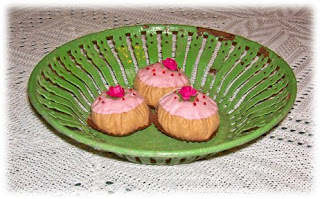 A very cute tin plate that is the same colour and about the same vintage as the bickie tin I bought from Kerryanne's yummy selection of Art For Sale on her Shabby Art Boutique site. 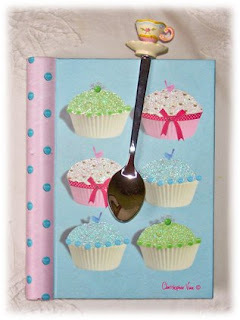 It's pictured with a few cute little felt cupcakes I bought on a visit to Linda and Laura's pretty shop, Lilly Cottage. So where is my plate now? On it's way to Kerryanne's studio because she's kindly offered to paint a pretty pink rose on it so it matches my bickie tin! Isn't she a sweetie!!! Thanks Kerryanne!! Can't wait to find a spot to display the two 'face-lifted' vintage pretties!! 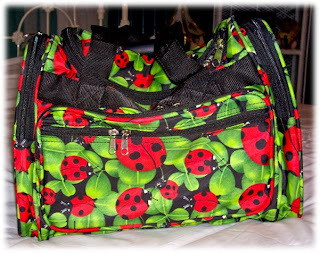 A Ladybird bag!! Isn't is great!! It's the perfect size for me to fit all my bear making paraphernalia when I teach a workshop, and I have a few of them planned already for the new year, so I'll be able to test it out! There was a matching overnight bag, too, that I would have loved to get, but since GB and I only got our overnight bags for Christmas last year, I couldn't quite justify it! SIGH! I hate it when that practical streak rears it's ugly head!! It doesn't happen too often, but when it does, its a voice that sounds remarkably like my mother's! Tee! Hee! Hee! The last pretty I'll share with you before I toddle off to play with my spotty pinwheels is a little treasure I discovered in my front yard yesterday. 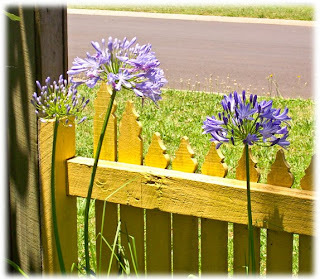 I planted four agapanthus clumps about five years ago. Last year for the first time, I had two flowers and yesterday, I discovered there are four flowers - YAY! Obviously they're happy and settled. Hmmm ... just noticed I've only caught three of the four flowers in the photo. Oh well, you'll just have to take my word for it that there's another!! I'm trustworthy ... really, I am!!!! Tee! Hee! Hee! Well, I'm off to play with spots and dots in the sewing room to try meeting one of those deadlines that's looming closer and closer. Hope you're all having a good week - we've had almost 300pts (75mm) of rain in the last few days, so everything's looking fresh and green. Here's hoping at least some of it ran into our dams, as they are at a low 9% of their capacity. 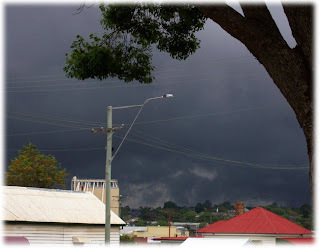 Apparently there's more rain on the way, too, so - fingers crossed! Sorry to all you wheat farmers who don't want it to rain while you're harvesting - we've waited a loooooooooong time for good rain, though!! Til next time - Bear Hugs! Well ... after a rather frustrating couple of days, I'm back on the air!! My beloved Geek Boy decided he'd upgrade our broadband package and despite being told we would be notified when they switch off our service before swapping over and how long we'd be without Internet service, we weren't told and the first we knew was ... I was off the air!! Aaaaaaarrrgghhhh! And when, after a day and a half we still hadn't heard from anyone and still didn't have service, I rang the 'service' department. I use that term loosely as I did NOT receive any service at all, was treated rudely and not at all helped!! So GB chased it up and FINALLY, I was back on the air late yesterday afternoon. (He must have sounded scarier than I did!) I really did miss my Internet service, plus I'd been expecting a few emails to tell me parcels I'd sent had arrived, so ... But all is good now, there is Internet flowing freely in my office again and I'm happy!! Now, once I had my Internet back, there were indeed a couple of emails that I'd been waiting for from the recipients of my 100 Post give-away. 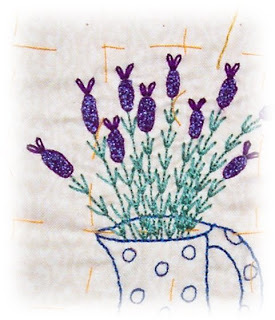 Stina and Diane both received their Stitchers Surprise packs and have posted photos that you can go take a peek at - which is good, cos I did Stina's trick and was so anxious to get the parcels posted off, that I forgot to take a photo - oops! And the other parcel that arrived was my Stitchers Angel Swap parcel that I posted off to ... MAY BRITT!! I had emailed May Britt to tell her I was her Angel and that I was running a bit behind schedule, so she'd been stalking her postie. You've all seen photos of her goodies, as I posted a pic back here, saying I felt safe to do so cos I was sure my Angel hadn't found my blog. Well ... you wouldn't read about it!! For the very first time, May Britt chose to leave a comment on THAT post! Tee! Hee! Hee! You could've knocked me down with a feather!! May Britt has also posted pics so pop on over and have a peek - plus all three of these ladies have WONDERFUL blogs, so they're well worth having a look at - just be sure to make a cuppa first cos there's LOTS to see!! 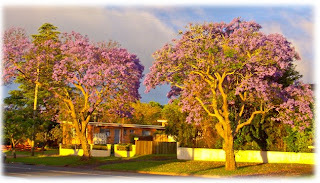 There's a loooooooong row of these gorgeous trees along one of our main roads in Toowoomba and at this time of year it's just magical, especially for a colour freak like me! I also took a close up to show what the individual flowers look like. Moving on to something else purple ... (well 'Sapphire', but it's a purple-y blue!) when I was shopping with my dancing buddy Deb today, some 'lovely' person got a little too friendly with my Baby car! Somewhere in Toowoomba, there is now a white car with a sapphire stripe – how do I know? 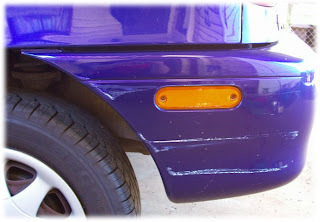 Said bad driver’s car left a distinctive white stripe on MY car!!! Grrrrrrr!! No note, no nothing!! Not Happy Jan!! Some people are just ignorant, not to mention lousy drivers, as my little car was well away from the car park line so there was heaps of room for them to get out. I sometimes think my poor Baby has a target painted on it, as I often pick up new scratches and little dents in shopping centre car parks. Some people are just careless and rude! SIGH! 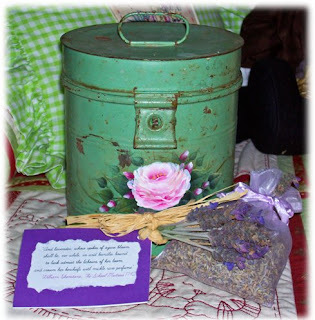 My GORGEOUS bickie tin ... along with some wonderfully fragrant lavender goodies! 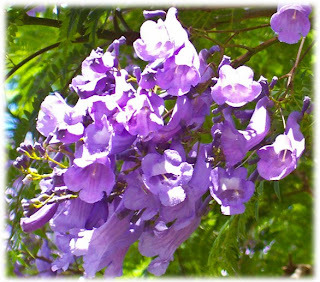 Now, Kerryanne knows that lavender is one of my favourite scents!! I think this little sachet is going into my fabric stash to make it all smell pretty and I'll be surrounded by lavender smells when I'm in my sewing room working. Thanks Kerryanne!! Then of course, I had to find a home for my new treasure. Found one!! Ta da! It looks right at home with my mixing bowls! These bowls are one of the best investments I ever made! Not only do they look great up on my kitchen cupboard, they are nice heavy bowls to cook with - they don't scoot all over the place when you're trying to stir!! There are still lots of treasures on Kerryanne's website, so take a peek - but be warned!! You WILL be tempted! Tee! Hee! Hee! The other exciting thing that involves Kerryanne is that she is having a double celebration on her blog at the moment. She's celebrating her 100th post as well as her first blogiversary and she's having a double give-away as her way of throwing a blog party!! Now I shouldn't tell you about it, really, because I want to win the gorgeous canvases painted with delicate tea cups ... or would be just as happy to find a home for the Christmas faux goodies, and if I tell all of YOU about it and you enter, the odds go up. Hmmm ... you know what ... forget I told you! Tee! Hee! Hee! And now, I'm off to put some finishing touches on the bear I've designed for an upcoming issue of Australian Bear Creations - have had a good run this week to make up for my 'blah' last week. So ... have a great weekend and until next time - Bear Hugs! Well, here I am, reporting in and very pleased to tell you that my foggy head seems to have cleared a bit and I'm almost back to what passes for normal for me! Thank you all so much for your lovely comments and emails commiserating and sympathising - they were very much appreciated! 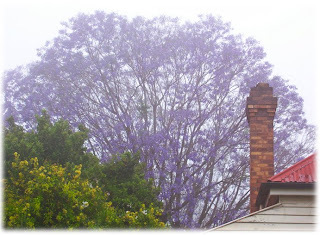 After chatting to a few bloggy friends, as well as my best buddy Lynette and a couple of HER friends, I discovered I wasn't the only one having a foggy, 'blah' kind of week, there were quite a few of us. I've decided that this week the moon must have been in a dark phase, the planets were out of alignment ... or there are a lot of women out there trying to fit far too much into their busy lives!!! Hmmm, I think option three is the most likely!! Now, when the fog cleared a little yesterday, I was really pleased to progress with a couple of the many projects I've got on the boil at the moment. I lit up the lavender in the oil burner, put Enya on the CD player and hit the sewing room to work on the project I will (all being equal!) be contributing to the February issue of Australian Bear Creations. I managed to get the sample bear bits sewn up and will stuff them tonight whilst watching a DVD with my beloved Geek Boy - cos there's nothing worth watching on TV on a Saturday night!! And you've got a hint of what this stitchery features! I found this wonderful jug at the markets when we were on holidays and fell in love with it - much to my mother's bemusement!! Tee! Hee! Hee! 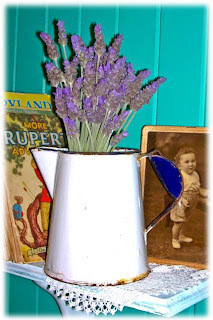 And when she saw this jug that I'd bought, Grandma went digging in her cupboard and found me one similar that belonged to HER mother, so now Great-Granny's jug has found a nice spot at my place to live!! Stay tuned to see the finished stitchery. See ... menacing!! unfortunately, these wonderful clouds only brought a spit and a spot or two along with a gusty storm wind before disappearing again, but I promised Jo in Tasmania that I would take a photo of a QLD summer storm to help her get over her homesickness for summer in QLD - there you go Jo!! 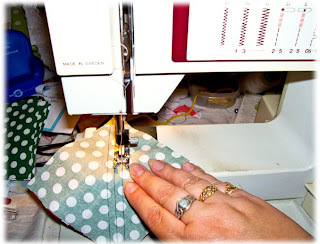 Now, before I shuffle back off to my sewing room, I HAVE to share some exciting news! Kerryanne over at Shabby Art Boutique has put some of her GORGEOUS art for sale items on her web site today!! Guess who one of her first customers was?!?! Yep, ME!! 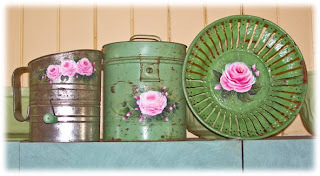 If you pop in for a look, you'll see a FABULOUS vintage bickie tin with a pretty pink rose-a-la-Kerryanne painted on the side with a big SOLD sign on it. That little cutie is coming to live at my place!! But there's lots of other fabulous shabby chic treats there for you to snaffle - but I wouldn't dawdle if I was you, cos these babies are likely to disappear quickly!! And now ... off to the sewing room!! Hope you're all having a great weekend whatever that may involve. Til next time - Bear Hugs!! Hmmm ... I think the "foggy" part of my title applies to me as well as the weather!! After a REALLY busy weekend, I just don't seem to have got going on all four cylinders this week. (you'll notice that in these tight economic times I'm comparing myself to the economy model of vehicle! Tee! Hee! Hee!) I seem to have done more procrastinating than achieving and more day-dreaming than doing!! SIGH! I'm sure my energy will come back soon - I hope! - cos that list of "Things To Do" is NOT getting any shorter!! And while my 'foggy' brain made me miss one appointment (Oops! Rescheduled for next week now!!) I DID manage to remember that I was meeting Leanne May of Candlelight Creations for lunch. 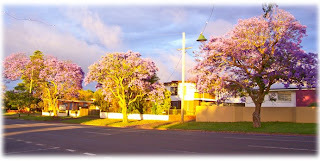 After chatting back and forth via email and blogs, the 'light' suddenly dawned on us both that not only do we both live in Toowoomba, we both work at Highfields, so SURELY we could manage to meet up for a cuppa or lunch somewhere along the track! So, today we did so and had a lovely time. There is no photographic evidence of our lunch for two reasons. Firstly, the damp foggy weather meant we were both having a frizzy hair day (a fact we commiserated over!!). Secondly - we both forgot our cameras! Tee! Hee! Hee! Leanne is busily getting some new patterns ready for a trade show, so has been burning the midnight oil. 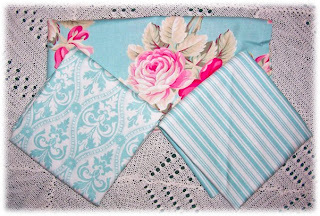 Pop across to her blog and scroll back through a few posts to enjoy some sneaky peeks at her GORGEOUS re-vamped Tea Time Roses pattern - I love the spots!! I also took the opportunity to pop into Quilters Angel to say g'day to Marian and we chatted about some secret squirrel plans for January - very exciting!! So, stay tuned for details once we've nutted things out! You will be very surprised to hear (I know my beloved Geek Boy was!!) that I DIDN'T purchase anything today!! See - told you I haven't been my usual self! Tee! Hee! Hee! However, I did eye off a few yummy fabrics that I'll probably go back for sometime soon!! 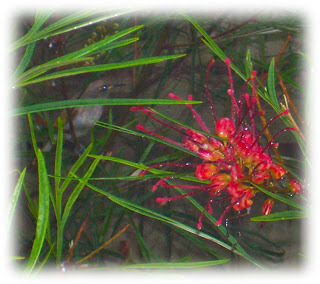 Can you spot the little feathered friend I found in the grevillia? There were actually two of these cuties flitting around, but they were a little camera shy, so this was the best I could get. So ... I still didn't get much achieved for the day, but I did enjoy my sojourn in the back yard. Perhaps I'll get my act together tomorrow and get some stitching/instruction writing/designing done. I do hope so, cos my week has just about run out!! Hope you're having a productive week - or at least enjoying your procrastinations!! Tee! Hee! Hee! Til next time - Bear Hugs!